The Basilica della Santissima Annunziata, today the most popular place for grand weddings, has always had a special place in the life of the city, and still does as the centre of celebrations for the Annunciation and Florentine New Year on 25 March. 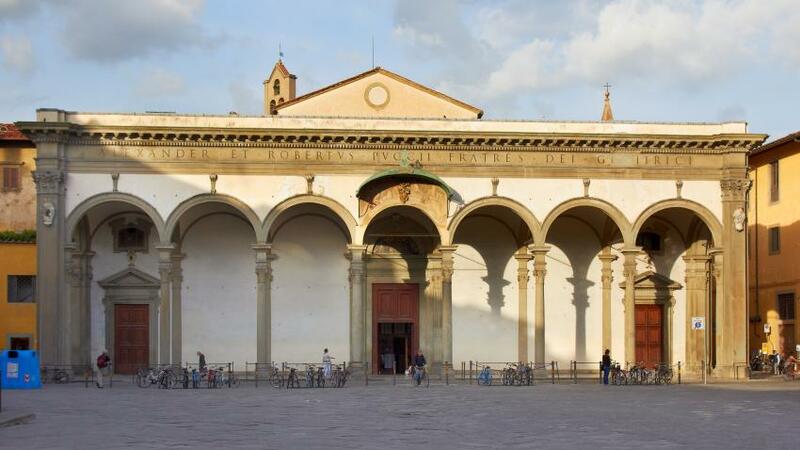 The basilica began as a votive church, built during the time of Matilda of Tuscany to celebrate Florence's surviving the siege of Emperor Henry IV. This church fell into decay, and was refounded in 1250 as the mother church of the Servi, the new Servite Order. Instituted by the 'Seven Holy Founders', sons of seven Florentine noble families, the Servites dedicated themselves to the cult of the Virgin Mary. In their day they were as important in Florence as the Franciscans and Dominicans. The Annunziata became a pilgrimage destination just a few years later, after the suspiciously dramatic appearance of a brand-new holy icon. A painter called Friar Bartolomeo (not the famous Fra Bartolommeo) was working on an image of the Virgin and found himself unable to properly paint her face. He fell asleep, and when he awoke the work had been magnificently completed—by the hand of an angel. 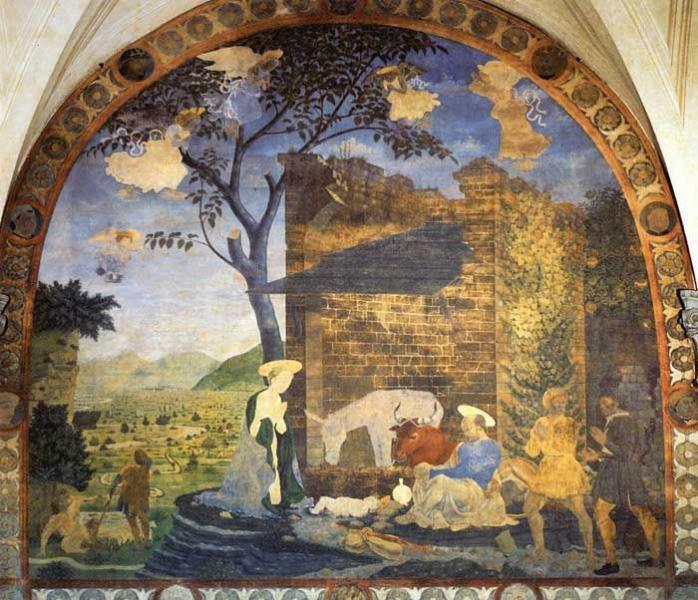 The miraculous painting eventually attracted so many pilgrims that in 1444 the Medici decided to enlarge and rebuild it. Both Leon Battista Alberti and Michelozzo had a hand in it, though sources differ as to who really created the final plan. No matter; almost all of their work would be overlaid by a lavish High Renaissance-Baroque veneer that proceeded in fits and starts until 1795. The church entrance lies behind a later addition, the supremely graceful Portico, the only architectural work by sculptor Giovanni Battista Caccini in 1601. 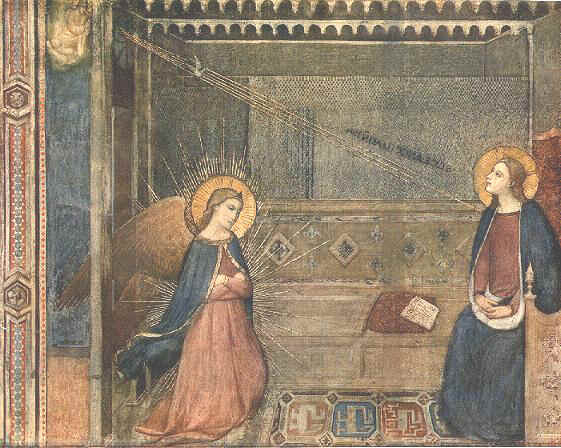 Above the entrance itself is a mosaic, an Annunciation by Ghirlandaio. Behind that, to shelter the crowds, Michelozzo gave the church a quadriportico, the Chiostrino dei Voti in front of the church, a small cloister that was added to house all with ex-votos left in the church, including some 600 lifelike, life size wax effigies of donors and famous Florentines, popes and foreign bigwigs (some of them on their horses) that hung along the walls of the basilica, Florentines on one side, foreigners on the other. The most famous one was of the Magnificent Lorenzo by Verrocchio, which had been placed here in thanksgiving for his close call in the Pazzi Conspiracy, dressed in the clothes he was wearing at the time of the attempted assassination. Once as popular a tourist attraction as Madame Tussauds, party poopers in 1786 removed them all and melted them down to make candles. The Chiostrino now has a glass roof to shelter its wealth of Renaissance and Mannerist frescoes, which were commissioned in 1516 to celebrated the canonization of the fifth Servite Prior General, Filippo Benizi. Most of these are by Andrea del Sarto and his students: two of finest the Birth of the Virgin and Arrival of the Magi (Del Sarto put himself in the right hand corner of the scene, in the blue hat), earned Andrea his nickname, 'Andrea sensa errori' but the most enchanting is Alesso Baldovinetti’s Nativity (1462), although it’s sadly faded, with only the ghost of a transcendent landscape. Also present are two youthful works: Pontormo’s Visitation and Rosso Fiorentino’s Mannerist Assumption, plus another Life of St Filippo Benizi by Cosimo Rosselli and Marriage of the Virgin by Franciabigio. The interior, the only one the Florentines ever spent much money on during the Counter-Reformation, is the most sumptuous late Renaissance work in the city. There's so much to catch the eye here, but the spectacular gilded ceiling usually wins out. Baldassare Franceschini designed it, and he also contributed the central fresco of the Assumption. Directly to the left as you enter is another work of Michelozzo, the Tempietto, hung with lamps and candles, built to house the aforemented miraculous Annunciation painted with angelic aid. Its construction was funded by Piero (the Gouty) de’ Medici, who couldn’t resist adding the inscription on the floor that ‘The marble alone cost 4000 florins’. The ornate canopy over the Tempietto was added in the 17th century. Often the Tempietto is piled with bouquets; instead of tossing them over their shoulder, Florentine brides bring the flowers here and offer them to the Virgin, asking her blessing for a happy marriage. The side chapels have massive walls in coloured marbles, with more gilt frosting. The first two chapels on the left side contain frescoes by Andrea del Castagno, painted in the 1450s but whitewashed over by the Church when it read Vasari’s phony story that Castagno murdered his fellow painter Domenico Veneziano – a difficult feat, since Veneziano outlived his supposed murderer by several years. Rediscovered in 1864, Castagno’s fresco of St Julian and the Saviour in the first chapel, the Cappella Feroni, has some sculpted Baroque bedfellows by Giovan Battista Foggini. The next chapel contains Castagno’s daring Vision of St Jerome, showing the saint torn by his privations in the wilderness looking up to a vision of the Holy Trinity. This demanded such extreme foreshortening that Castagno in frustration ended up painting red cherubs a secco over the lower part of Christ’s body, although these have partly peeled off over time. The next chapel contains scenes from Michelangelo's Sistine Chapel Last Judgment by Alessandro Allori, while the next contains an Assumption of the Virgin by Perugino; the sixth chapel houses the SS Ignatius, Erasmus and Blaise by Raffaellino del Garbo. The right aisle’s fifth chapel contains a fine early Renaissance tomb, that of the obscure Orlando de’ Medici by Bernardo Rossellino. The neighbouring chapel in the transept has a painted crucifix by Baldovinetti, while in the next one the Pietà is the funerary monument of Cosimo I’s court sculptor and Cellini’s archrival Baccio Bandinelli; in this Pietà he put his own features on Nicodemus, as Michelangelo did in the Pietà in the Museo del Duomo. Michelozzo’s long nave design culminates in this unusual polygonal Tribune around the sanctuary, complete with a triumphal arch by Alberti, a combination inspired by a study of classical forms. Nine semicircular chapels radiate from the Tribune. The square one at the rear was designed by and contains the tomb of Giambologna; his pupil Pietro Tacca is buried with him, and has a Gothic altarpiece by Bernardo Daddi. The next chapel to the left contains a Resurrection by Bronzino, one of his finest religious paintings, followed by chapel with Perugino's Madonna and Saints and then Alessandro's Allori's Birth of Mary. To the left of Alberti’s triumphal arch, under a statue of St Peter, is the simple grave marker of Andrea del Sarto; next to it is one of Florence’s loudest Counter-Reformation blasts, the tomb of bishop Angelo Marzi Medici (1546). The organ (1628) is the oldest in Florence, and the second oldest in Italy. The Chiostro dei Morti (or Chiostro Grande) off the left transept, is decorated with 25 lunettes frescoed in the 17th century, but the star of the show is Andrea del Sarto’s Madonna del Sacco (1525), an unusual work named after the sacks of grain supporting the reading St Joseph. Off the Chiostro dei Morti, the Cappella di San Luca is dedicated to the patron saint of artists; it has frescoes by Pontormo (Virgin and Saints) Giorgio Vasari (St Luke Painting the Virgin, where Vasari painted his own mug in place of St Luke's) and Santi di Tito (Building of the Temple of Solomon) among others. It contains the graves of Cellini, Pontormo, Franciabigio and other artists. The Convent, now the headquarters of Istituto Geografico Militare, made the headlines in 2007 when a wall was knocked down, revealing a forgotten stairway by Michelozzo, a lunette, perhaps by Paolo Uccello and frescoes of birds, believed to by Leonardo da Vinci, who did spend two years here while working on the frescoes in the Palazzo Vecchio.